Q1. For me, one of the most wonderful aspects of The Search for Heinrich Schlögel are the bits of ephemera—there are letters, journal entries, a map, a newspaper clipping. How did the book itself originate? Were you inspired by an image or a quote or a bit of ephemera like those that appear in the book? This novel began with chaos and numerous questions. I’d been thinking a lot about ideas of “North.” I’d been reading about the Department of Indian Affairs, the interest of the Hudson’s Bay Company, early on, in creating a population chronically indebted, the relocating of people, the shooting of sled dogs, the establishment of residential schools. Then, hiking in the Rockies, I crossed paths with a German photographer intent on capturing the sublime. It occurred to me that I might turn the tables, have a European become a “primitive,” a potential object of scrutiny, someone considered out of sync with the flow of time. My European, yanked from the 20th century and weirdly deposited in the 21st, deeply disoriented, might meet up with an Internet-nimble Inuit teenager. I knew about Abraham Ulrikab, the Inuk from Labrador, displayed in the Berlin Zoo in 1880. Right away, I decided that Heinrich Schlögel’s life would be pieced together by a stranger gathering evidence of the sort you mention: letters, journal entries, newspaper clippings. W.G. Sebald’s works are never far from my consciousness. The Canadian artist, Spring Hurlbut, released her father’s ashes into the air, allowed them to fall onto a dark background, and took a photograph. The ashes look like a nebula: a perfect novel – the story all there and the story missing. This novel is not a nebula, though it’s full of suspended ephemera. It has a definite direction, because the last scene, which is a surprise, came to me first and I had to get there. Q2. Some of the journal entries were written by the British explorer Samuel Hearne, who was the first European to cross northern Canada to the Artic Ocean. Did you know about Hearne’s journey before you began to tell the story of Heinrich’s? How did you come to the decision to integrate an actual person and his historical accounts into the narrative? One summer, when I was a child, my father became engrossed in the diary of Samuel Hearne and kept reading passages aloud. Hearne was an explorer whose expeditions failed, according to my father, until women were included. Women could carry a lot of weight, had better endurance, and were useful in many other ways. That was all I retained bout Hearne. But when I realized that Heinrich needed a hero, someone besides his sister, Hearne came to mind. I read his diary and decided that I wanted his actual words, their tone and texture, to figure in the novel. Q3. What other kinds of research did you do for the book? I was very lucky, and able to travel to Baffin Island, where I hiked up the Weasel River valley to the Turner glacier and back. The hike took two weeks, and then I stayed on for a while in Pangnirtung, a hamlet where the main language is Inuktitut. As for Germany, I visited Heinrich’s hometown near lake Constance, gathering information; and I dipped into the memories of a friend who grew up there. My reading jumped all over, including accounts by survivors of residential schools, an Inuktitut grammar book, a recent study of Pangnirtung by two American anthropologists, and a recounting of the life of Abraham Ulrikab, based on his journals, which he wrote in Inuktitut and which were translated into German by a Moravian missionary, after Abraham and his family died of smallpox while being toured from zoo to zoo. Q4. When Heinrich emerges from his hike on Baffin Island, he lives and becomes friends with an Inuit woman and her granddaughter. How much did you know about the Inuit people before you began writing the novel? I was familiar with Inuit legends, Inuit printmaking and sculpture, and had seen Zacharias Kunuk’s extraordinary film, Atanarjuat: The Fast Runner, the first feature film ever written, directed and acted all in Inuktitut. But initially I wasn’t focused on Inuit culture in particular. I was delving into chapters of Canadian history that had not been taught to me in school, history being reclaimed in brilliantly subversive and exciting ways by contemporary visual artists from across Canada. Kent Monkman was slipping drag queens into recreations of 18th and 19th century depictions of historical scenes; Nadia Myre, with the help of over 230 volunteers, was covering all 56 pages of the Indian Act with red and white glass beads; Brian Jungen was making West coast aboriginal masks from Nike Jordan Trainer shoes. Once I started writing the novel, I turned my attention North, and began listening to the terrific spoken-word artist and throat singer, Taqralik Partridge. I also stumbled on Donald Weber’s close-up portraits of Inuit women, men, children, and teenagers, their faces illuminated by the blue light from their computer screens. These haunting photographs say so much, succinctly, about Inuit resilience. Q5. You are also a published poet. Does your poetry writing inform your prose writing? Regardless of what I’m writing, poetry or prose, much of my thinking consists of picture and metaphor. But when I’m writing prose, I’m not hearing poets in my head but the voices of Coetzee, Kincaid, Banville, Sebald. It’s the quality of their sentences that I’m aiming for – their elegance and lucidity, their fierce precision, their rhythms and layering; not that they aren’t very different from each other. Maybe even more than what I’ve read as an adult, my earliest, formal encounters with language, determine how I write. I learned to read in French before English. For better or worse, I was immersed, very young, in Moliere, Corneille, Racine. When I was in grade three, the Cold War was raging, and we were taught Russian. A film strip of a burglar climbing through a window, and a song about killing a rabbit, that we had to memorize and perform. All this, I imagine, still affects how I make sentences. Q6. 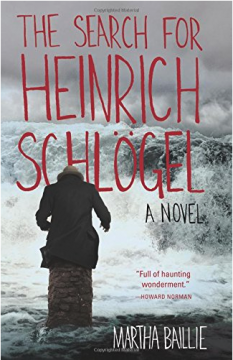 Heinrich’s story is narrated by an unnamed archivist who is attempting to find out what happened to him. What was the inspiration for telling Heinrich’s story through her? When reading any History, it is crucial, of course, to consider who’s doing the narrating, whose fears and ambitions are shaping the material. I ask the readers of my novel to piece together its narrator’s identity, just as she is piecing together Heinrich, who in turn is searching for himself by reading about the life of Hearne, because the many subtle means by which we impose and carve out of who we are, and who we imagine others to be, fascinate me. Besides, I wanted to have fun. Technologies of narration are becoming so pliable, information so layered, and sources evasive, how could I not invite readers to be curious about who is doing the telling? Q7. Do you know where Heinrich is now? 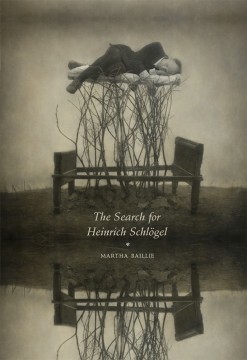 The best answer I can give is to suggest that you visit the archive at http://schlogel.ca. There, you’ll hear many different voices keeping him alive, and find hundreds of paintings and photos that may point to where he’s gone.